We're reviewing Horror Classics Mystery Minis for October, and you thought I wasn't going to do both werewolves? Despite my noted and repeated affinity for werewolves, and the fact that this is the seventh Wolf Man figure I've personally reviewed, I've only seen the actual movie once. Maybe twice. Heck, I've seen the 2010 version more often than that! And while Benicio del Toro's Wolfman would also make for a very cool Mystery Mini, this is obviously the 1941 Lon Chaney Jr. one. The classic! Luckily for me and my obsession, the Wolf Man is one of the 1:6 figures in this series, meaning there are two of him in every case (along with Jaws and Elvira, weirdly enough). 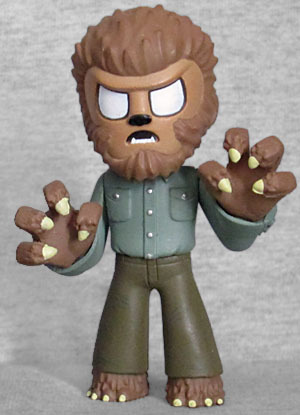 The designers have done a wonderful job of turning Jack Pierce's Wolf Man makeup into the Mystery Minis style. His head is furry, he's got a heavy brow, and his mouth is open just far enough to show off his underbite. While most Mystery Minis lack noses (and not just the zombies), this one not only has a little black sniffer, there's a ridge between the eyes to create the whole snout! The Wolf Man is posed with his claws bared, because apparently the magic of Lady Gaga even travels back in time - after all, at 2⅞" tall, he's literally a little monster. The fingers are square, as is the usual style, but they're furry and he has yellow nails poking off the ends. He's wearing his typical green shirt and olive drab pants, and his buttons are painted in silver. His legs are very straight, which does cause a problem: between the large head, the fact that he's holding his hands up in front of himself, and the narrow stance, the toy leans forward and falls over easily. Careful where you stand him. There were a few Universal Monsters in Horror Classics Mystery Minis Series 2 - Frankenstein and the Creature from the Black Lagoon - while Series 3 adds the Wolf Man and the Mummy. Wolfie is so cute, I regret passing on the previous ones. This entry was posted in blog exclusive review, Funko and tagged Mystery Minis, Universal Monsters. Bookmark the permalink. Awesome figure -- I ended up with two of them. One stayed at home, the other looms over Lego Minifigures on my work desk. I bought a case, and I was VERY unhappy about that. Two Sharks, two Wolfmen and two Elviras...and then The Mummy was 1:24! They didn't do such a good job with the casepacks on this on.